Every day I hear women say things about themselves that they would never dare say about another woman. The same things they shut down when they hear other women say these things about themselves. You know how it is. We say things like I hate my body shape, my hair is so awful, I am so overweight, look at these wrinkles, I am just not pretty like others, the list goes on and on and on. We say the most horrible, negative things about ourselves. We look in the mirror and what do we do? Complain. Criticize. Degrade. Belittle. Cry. Yet we hear another say the very same words we are saying and we quickly jump in to tell them how beautiful they are. Why is it wrong for them to say these things about themselves but okay for us? Why? Why can we not remember that God created us? Why do we continually let the world's twisted view of beauty shadow what we know to be truth? God created you in His very image. Genesis 1:27 tells us right there in black and white truth that we were made in the image of the Father. We look like God. You look like God. He created you, His precious child, to look just like Him. Would you ever tell God that His hips were too wide, wrinkles too deep or nose too big? Of course not! So why tell yourself that? You look like Him. Exactly like He wanted. The verse in Psalm 139 says that God knit us together. He knit us exactly like He wanted us. He didn't randomly toss a bunch of cells out there and say, "well, I guess that one can be Jenifer." No. He knit us. Lovingly put us together, piece by piece. I think of a child focused and carefully drawing their masterpiece. God did that to you. He carefully put you together exactly like He wanted. What about others with the same features? 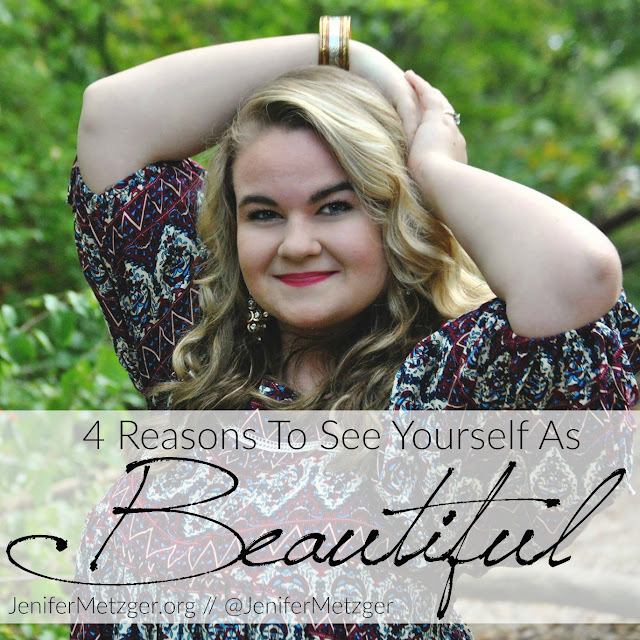 Have you ever heard a woman complain about her looks and thought, "really? Because I have that same feature. She must not like that about me either." I have. Many times if I am honest. We should never, ever compare ourselves to others. God made us how He wanted us. But it is easy to feel less-than when we hear others complaining about something and it is a feature we possess too. Think of your children. What is that feature that you hate the most? The one you complain about often. Does your child, niece, nephew or grandchild share that same feature? How do you think they feel when you complain about it? What message are you sending them? That you dislike this feature on them as well? That they aren't good enough because they carry this gene? You would never want your children to say such awful things about themselves but the truth is, you are saying it for them when you complain about yourself. Today I want you to write out Psalm 139:13-14. Write it several times. Put it in your prayer journal. Write it on index cards. Post it in your home where you will see it often. Commit it to memory. Whenever you are feeling down or are tempted to criticize yourself, recite the verse. Remember that you are fearfully and wonderfully made.